Beautiful certificate from the W.H. 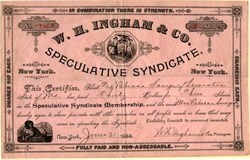 Ingham and Company issued in 1888. This historic document has an ornate border around it with a vignettes of the New York State Seal on top and a dog on the bottom. This item has the signatures of the Company's managers and is over 118 years old. On the top of the certificate it says" In combinition There is Strength".